The K-State Collegium Singers, directed by David Wood, will mark the 150th anniversary of the end of the U.S. Civil War with a concert "A Song of Liberty" at 7:30 p.m. April 22 in the historical Pioneer-Blachly Halls of First Congregational United Church of Christ in Manhattan. The program will be repeated at 7 p.m. Saturday, April 25, at Country Club Congregational United Church of Christ in Kansas City, Missouri. The concert will include music from American independence era and its infancy as a nation, including works by the first celebrated American composer, William Billings, and selections of early American hymnody in the sacred harp tradition. 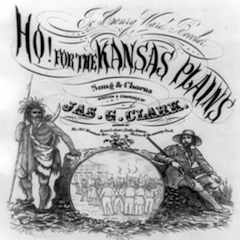 The second half of the program will highlight music from the abolitionist movement and songs of Kansas emigrants and the Free-Staters, many of whom were among the earliest European settlers of the city of Manhattan. The K-State Collegium Singers is the vocal ensemble associated with Collegium Musicum, the university's historical performance ensemble comprised of K-State students, faculty, staff, and members of the Manhattan community.